Cape Town – South Africans will be paying a higher rate of VAT for the first time since 1993 from April 1. Finance Minister Malusi Gigaba announced on Wednesday that the VAT rate will be increase by one percentage point from 14% to 15%, and is expected to raise an additional R22.9bn. Some basic food stuffs, as well as paraffin, will remain zero rated. The increase is part of tax policy proposals included in Gigabas maiden budget to raise R36bn in additional tax revenue for the 2018/2019 financial year. The increase in VAT, which contributes just over a quarter of the countrys gross tax revenue, will contribute the largest share of additional revenue in the budget. Of the R36bn in additional tax revenue Treasury proposed on Wednesday, the one percentage VAT hike will contribute R22.9bn, or 63%. We have not adjusted VAT since 1993 and it is low compared to our peers, said Gigaba in his speech. The finance minister said that the current zero-rating for basic food items such as maize meal, brown bread, dried beans and rice would limit the impact on the poorest households. Paraffin is also zero rated. He added that vulnerable households would also be compensated through an above inflation increase in social grants. Government does, however, intend to tweak the zero-rating for brown bread. While brown bread and whole wheat brown beard will remain zero-rated, fancy breads such as rye or low GI bread will now be subject to VAT. While Treasury considered instituting a tiered rate of VAT, with higher rates for some goods, it was eventually decided that this would add significantly to the complexity and administrative burden of the tax. The increase in VAT was considered likely by economists and analysts prior to the budget. We predict a possible increase in the VAT rate as it can raise large amounts of revenue, said FNB on Tuesday. But raising the VAT rate was also seen to be tricky political move. 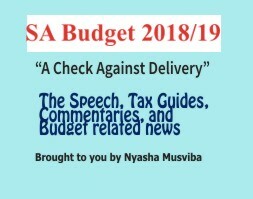 Although raising VAT is a more effective way of raising additional revenues, the country is facing a national election in 2019, making higher VAT rates a controversial decision, said economists Sanisha Packirisamy and Herman van Papendorp from Momentum Investments in a pre-budget statement. Trade union confederation Cosatu, meanwhile, argued, as it has done in previous years, against the VAT increase. Cosatu expects government not to throw the working and middle classes under the bus with VAT and income tax hikes, said the federation earlier in the week. COSATU will not support any attempt by government to balance budget shortfalls and deficits upon the backs of struggling workers. Gigaba, in a pre-budget briefing, said he would be discussing the move trade unions later. It is sometimes necessary to take the decision and embark on consultation afterwards, he said.